Many animals of the Extremadura are nocturnal and can only be observed during dusk and night. To encounter those species we took our car and drove off just after the sunset. With prepared cameras, focused on the light beam of the car's headlights, we went for the photo hunt. 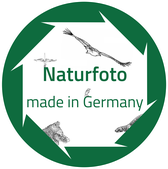 An Iso value of above 4000 was required to get at least useful proof pictures. Characteristic for those night rides were long time periods where nothing happend at all. The more we enjoyed observations of animals, which occurred on or next to the street. Beside red deer, boar, wildcat and co, we encountered various reptiles, heating up on the warm streets and amphibians, using the darkness for migration between waters. After several rainy days, many amphibians, like this natterjack toad, used the night for migration between waters. They were not afraid of cars, headlight or flashlights at all and thus were patient photo models. With a body size of 8-9 cm, the natterjack toad is smaller than the better known common toad. 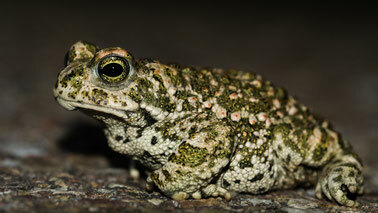 Contrary to their Central European conspecifics the Southern European natterjack toads don't need a winter rest. 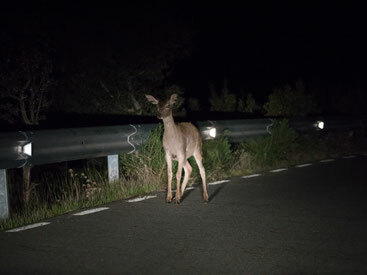 The most common species we encountered on our night rides was the red deer. 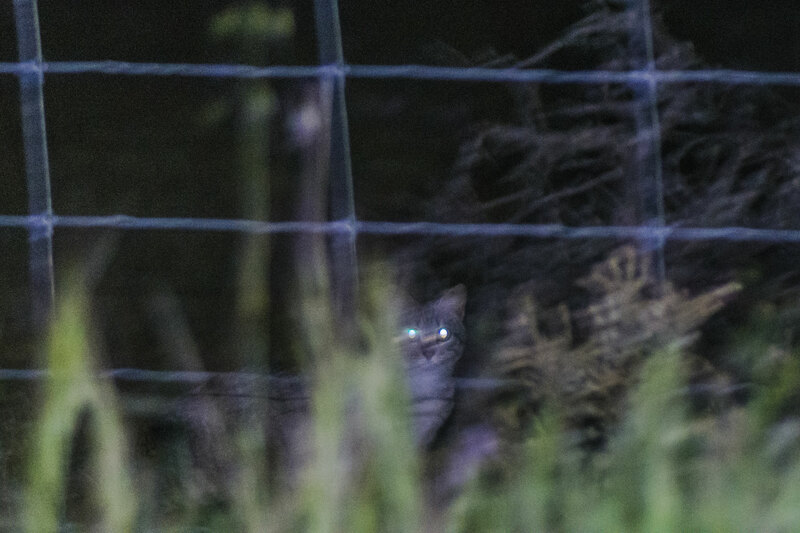 They could be observed directly in the headlights or as shining eyes in the darkness, but were never scared of our presence and just patiently wandered their way. The red deer of the Extremadura is smaller than our Middle Eurpean specimens. This phenotypic variation can be explained as adaption to the hot and dry climate of the Extremadura. 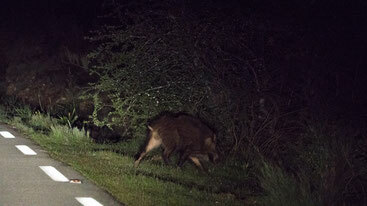 Also the wild boar inhabits the Extremadura and occurred on our night rides. This specimen pursued another boar across the road and both scrambled directly next to our car before leaving off into the darkness. The wild boar in the Extremadura benefits of the large amount of acorns that are dropped by the evergreen oaks during autumn. This ladder snake heated up on the road in the early night hours, when the asphalt is still warmer than its environment. This specimen was not scared by our approaching car. 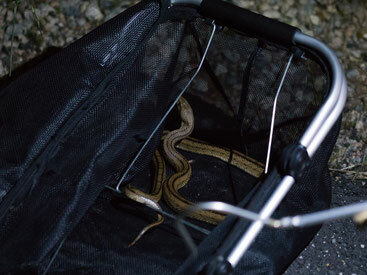 We got off the car and put the lethargic snake into a basket to determine its species. After a short time and some feint attacks we released it into the wilderness, aside the road. The ladder snake is with a length of up to 1.6 m a larger species of the family Colubridae and mostly hunts small mammals. In our opinion the ladder snake, with its noticeable markings, is one of the most beautiful snakes of Europe. 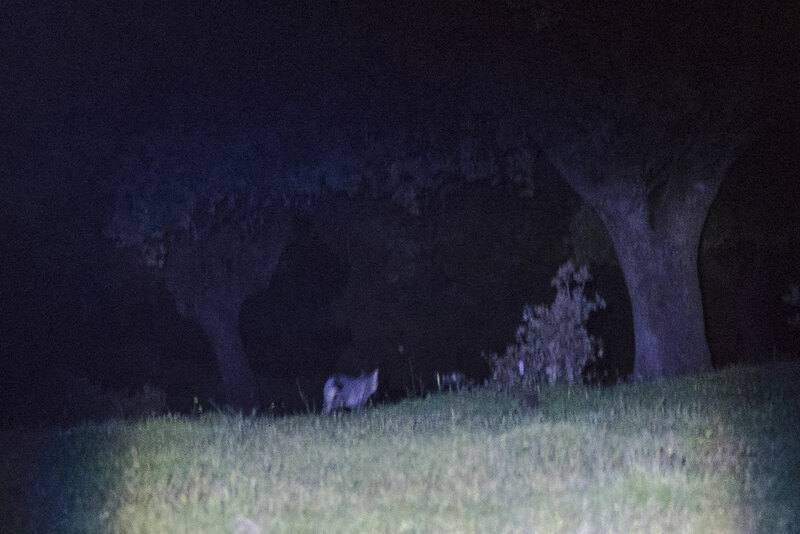 Another nightly highlight was the encounter with a wildcat. At first we just saw a shadow quickly disappearing off the road into the bushes. In the light of our flashlights we were able to produce these two proof pictures, before the cat left of into the darkness. Contrary to Middle Europe, where the wildcat is a very rare species, they can be encountered more often on the Iberian Peninsula. Wildcats are significantly larger than house cats and have larger ears and a short bushy tail with black tip. During a night hike to a spot where we had placed a wild camera, we were accompanied by a very loud mole cricket concert.